Klintiendharm Foundation Thailand is a branch of Than Hsiang foundation. The Klintiendharm (or Than Hsiang which means 'fragrant sandalwood') Foundation is a Buddhist Foundation based on the thoughts and vision of Master Wei Wu. It was established the 9th of December 1999. Klintiendharm's functioning is based on the experience and track record of the Than Hsiang Temple, Penang and its various branches in other parts of Malaysia. * Free English education for monks. By April 2002 some 100 monks attended classes at various levels. The books used for both series of classes are 'The New Road', parts, 1, 2, and 3, written by Dr. Arporn Brikshasri. * The International Buddhist College Project. This project took shape in the year 1999 when a plot of land near Hatyai in Thailand was donated and the first outlines of a campus were drawn. * Classes in Mandarin. These classes started on April 2, 2002 and are led by Arjan Santad Prachyapruang. They run on Tuesday and Thursday from 19.00 to 21.00 hours. The book used is 'Speak Mandarin in 500 words' published by the Overseas Chinese Library. * Classes in Thai. Foreigners who wish to master the Thai language will be pleased with the lessons we now offer. Weekly class are on Wednesday, running from 19.00 - 21.00 hr. * Sunday Dharma School, as of May 5, 2002. * Visits to an Old Folks Home. This is a monthly activity, as of March 2, 2002. * An English Fun Camp for teenagers held from April 19 through 21, 2002. * Maintenance of an Internet site giving more detailed information both on Klintiendharm Foundation in Thailand and on Than Hsiang temple in Malaysia. Main advisor and patron of the Klintiendharm Foundation is master Wei Wu. The Foundation's committee totally consists of Thai nationals. President of the Foundation is Khun Saranya. The Foundations supporting team has Khun Songkeat Teerarojwong, who is the Vice President, Khun Dilok as Honorary Secretary. The Honorary Treasurer is Khun Sombat Tantiabichat. Dr. Arporn Brikshasri is the Education Advisor. Khun Patama Tantaputta is the Ladies' Activities Coordinator. 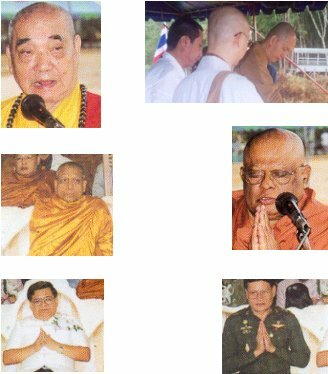 By April 2002 all running Klintiendharm Foundation's activities take place in or are managed from the Foundation's Headquarter at Klintiendharm(Than Hsiang) Foundation Thailand, International Buddhist College, 88, Mu 2, Thung Mo Subdistrict, Khuan Sato, Amphoe Sadao, Songkhla 90240, Thailand. * To provide for a comprehensive and in-depth study of Buddhism from a non-sectarian point of view. * To promote knowledge and understanding of the different schools of thought and cultural traditions within Buddhism. * To serve as Center of International Buddhist Culture, offering opportunities for inter-religious understanding and fellowship among the three Great Buddhist Traditions of Asia: Theravada, Mahayana, and Vajrayana. * To promote fellowship with other seats of Buddhist learning in Thailand and other countries, through link programmes, joint collaboration and exchange of scholars. * To organise international symposia, seminars and workshops and to sponsor publications relating to Buddhist studies and disseminating of Buddhist knowledge. * To train bhikkhus and bhikkhunis as successful communicators of the Timeless and Universal Message of the Buddha, particularly through modern electronic and printed media. * To promote Buddhist moral and cultural values and to demonstrate the validity and the relevant of the Social Philosophy of Buddhism as a basis of a universal humanist culture for the globalized world. * To promote and sponsor Buddhist social service through study programmes and practical training.